A deposit of 25% of the cost (with a minimum of £50 for one-night stays) of your whole stay is required to confirm the booking. By making your booking, you are confirming that you have read, understood and accept our terms and conditions. Our agreement is a legal contract and £50.00 of your deposit is non-refundable. The balance of your holiday is due 6 weeks before your arrival. If you can provide more than 6 weeks’ notice of cancellation no further payment is due and the balance of your deposit (less £50.00) will be returned to you. If you cancel within 6 weeks of your intended stay the full value of the stay will be retained unless we succeed in re-letting the booking. We strongly recommend that guests take out holiday cancellation insurance. We would only cancel your stay if your accommodation was unavailable for reasons beyond our control. We would however attempt to find you alternative accommodation. If this was not possible, or unacceptable to you, then we would refund all monies paid by you for the stay. Our liability would not extend beyond this refund. Your hut will be available to you from 3.30pm on the day of arrival, unless otherwise arranged. We may not be able to accommodate you if you arrive earlier than the agreed time as we will be busy preparing for your stay. Please be ready to leave the site by 11.00am on the day of departure, unless otherwise arranged. The guests are responsible for leaving the accommodation as they found it in good order and in clean condition. Guests must ensure that they behave in a responsible manner in both relation to the huts and the general neighbourhood during the occupancy. The guests must ensure that the hut is never left unlocked when unattended. Smoking is strictly forbidden in the huts but is allowed anywhere outside. All traces of smoking must be removed at the end of the visit. Please take care when staying in our property. You are responsible and liable for any breakages or damages, which you cause, to the huts or their contents. All we ask is that you report any incidents as they occur. We do not normally charge for minor breakages, but we may send you an invoice for repair or making good if the damage or breakage is significant. Our beautiful huts are designed for two adults sharing and the accommodation and surrounding land are not suitable for children. Under no circumstances may more than two persons occupy each hut. Admittance may be refused if this condition is not observed. The owners reserve the right to refuse or revoke the bookings from parties which may in their opinion be unsuitable to occupy the property. Bookings will not be taken from persons under 21 years of age. We regret that pets cannot be accepted. If you have an assistance dog please contact us. Complaints must be made known to the owners as soon as is practicable whereupon the owners will endeavour to resolve any issues. Any complaint not reported to the owners during the stay and only reported after the guests have left will not be considered by the owners. Any data collected during the course of this booking will be stored on our computer(s). With your permission we may from time to time contact you about promotions and offers. Please advise if you do not wished to be contacted by us after your booking has been completed. We will not share your details with any third party. 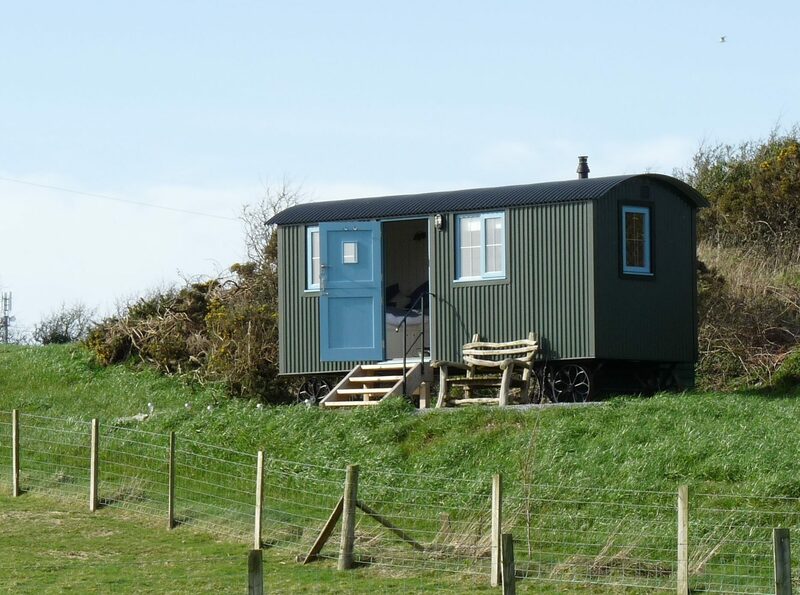 We look forward to welcoming you to Anglesey Shepherds Huts at Cae’r Bryniau and trust you will have a most enjoyable stay. The huts are accessed a flight of steps and therefore cannot be accessed by wheelchairs. Bryn is halfway down a slope. We may be able to accommodate those with some limited mobility and those who are visually impaired or with hearing difficulties. Please contact us if you have any worries prior to booking. There is car parking for up to two cars per hut. Visitors to Cae may park next to the hut although Bryn is a little further away from the parking area. We provide a wheelbarrow to help you move your belongings to Bryn. If you would like some help, please let us know. Do please call us if you have any specific questions and we will do our best to accommodate your needs.